We love fashion bloggers here at Republic… in fact, many of us have claimed the title ourselves and started our own blogs. There’s something very addictive about nosying around other people’s wardrobes! When my fellow fashion blogger and Republic Social Media Diva Mags asked if I wanted to choose a team of bloggers for a Disco Pants Style Off, I couldn’t refuse. Not only do I love those shiny spandex beauties, but I love seeing how a collection of people style the same item. Challenge accepted! My competitors were Olivia from What Olivia Did and Kristabel from I Want You To Know. Bring it on, ladies! For my Disco Pants outfit, I wanted something that was easy to wear with a ‘fashion’ edge. I find Disco Pants most flattering when worn with layers – a cropped tee like this Crafted Basic Cropped T-Shirt, with a longer shirt over the top like the Soul Cal Deluxe Chambray Shirt. To finish the look I added simple monochrome pumps like these Miso Crochet Ballet Pumps and a statement necklace – try this version for a similar style. Simple, sleek and flattering for more curvy figures. I love Kristabel’s crisp, summer look – she’s paired her Disco Pants with a fresh tunic top, like this Glamorous Peter Pan Dress, quirky clogs like the Pumpkin Suede Wedges from Miss KG and a long, delicate necklace similar to this one from Miso. The look is perfect for cooler days and Disco Pants make a great alternative to tights! Olivia went for the Sandy-from-Grease look – loving her rock ‘n’ roll style! Disco Pants are much more flattering and far easier to wear than leather trousers… team them with a biker jacket like this one from G Star, a simple black vest like the Crafted Basic Muscle Vest Top and a pretty pair of shoes for a feminine touch, like the Miss KG Annalise Heels. Instant rock chic! 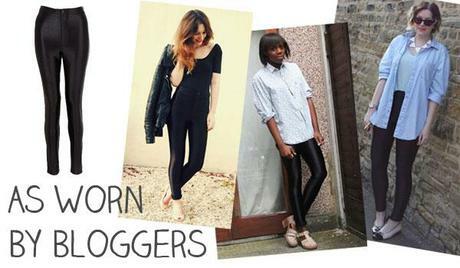 And there you have it – three ways to wear Disco Pants from three fabulous (if I do say so myself) fashion bloggers. But which is your favourite? And how do you wear yours? Tell all on our Facebook page!